One more benefit of friendship! Connect your friends and family to CLUB WYNDHAM ASIA and you can all be rewarded. Download the Full Brochure here! 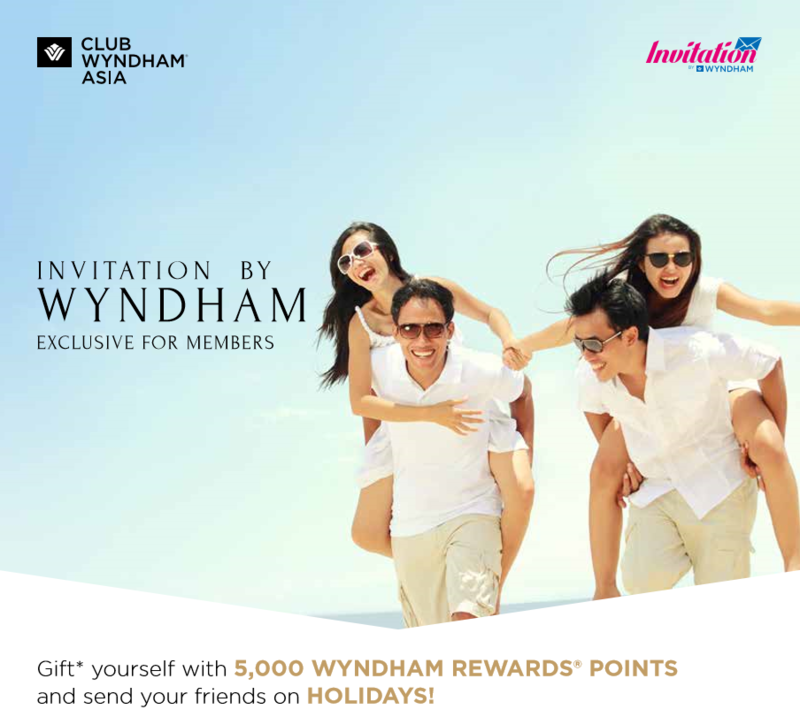 Invite your friends and family to CLUB WYNDHAM ASIA and you can both be rewarded. ^ Invitation by Wyndham Program Conditions. Singles officially registered with single status, travelling alone qualify to attend by themselves. Members of a couple (or single) must be aged between 30 and 60 years of age. or if married, both parties, must attend and complete our Vacation Ownership presentation of approximately 90 minutes (whilst on their holiday) on the benefits of CLUB WYNDHAM ASIA. Offer is subject to availability. Your referrer benefits will be awarded up to 21 business days following your referral’s showcase date. Wyndham Vacation Resorts Asia Pacific (HK) Limited reserves the right to substitute any reward for another, in its sole discretion, of equal or higher value. Wyndham Vacation Resorts Asia Pacific (HK) Limited reserves the right to change or terminate this Member Referral Program at any time for any reason without notice. Please note that from time to time we may contact you directly to advise of other promotional offers (separate from the Invitation by Wyndham program) available to you for referring friends. Should you elect to take up these offers, you will not be eligible for rewards under the Invitation by Wyndham program. Members who are employees of Wyndham Vacation Resorts Asia Pacific (HK) are not eligible to participate in any competitions related to the Invitation by Wyndham Program although they are eligible to receive Invitation by Wyndham benefits from referrals they provide for the Invitation by Wyndham program.